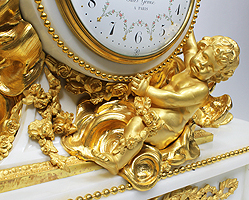 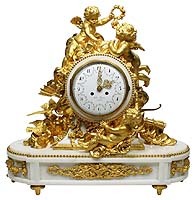 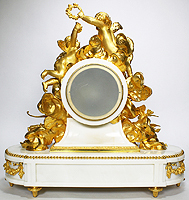 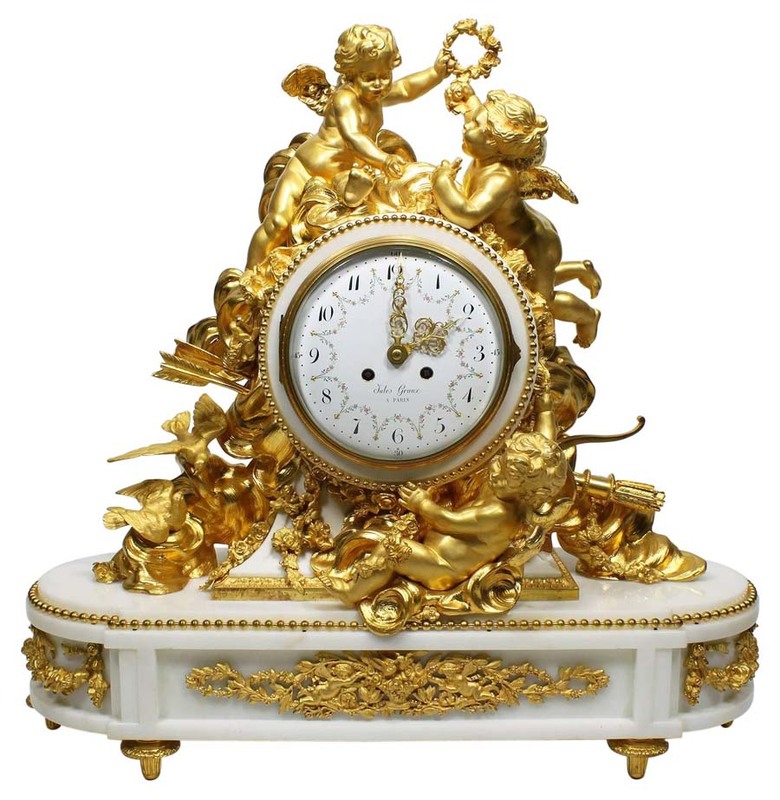 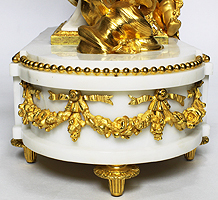 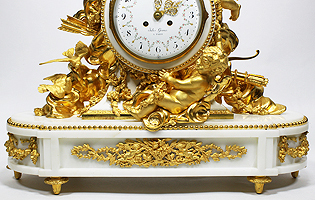 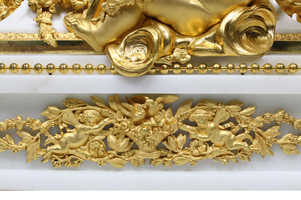 An Important and Palatial French Louis XV Style 19th Century Gilt-Bronze and White Marble Mantel Clock Attributed to Alfred-Emmanuel-Louis Beurdeley, the casting and gilding by Jules Graux, Paris, The Movement by Japy Freres & Cie. 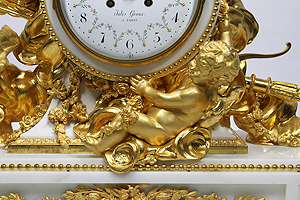 The large and impressive marble and two-tone finely chased gilt-bronze and white marble body, with it's original superb quality mercury satin-gilt and burnished gilt (ciselé et doré au mat), surmounted by two reclining cherubs amongst clouds, one holding a triumphant wreath the other a floral bouquet, flanked to each side by floral swags and attributes of Love with kissing doves, on a shaped base with a further cloud-borne cherub, above a scrolling foliate frieze and garlands of flowers, with a bow, arrows, a trumpet on toupie feet. 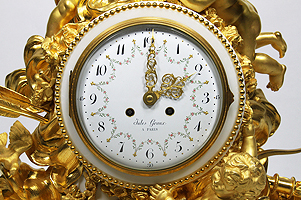 The beautifully decorated circular white enamel dial with wreaths of flowers and gold fleur de liz' jewels, with arabic numerals, signed Jules Graux, A Paris. 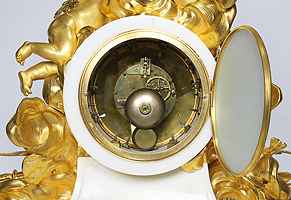 The bell striking movement with outside count wheel, pin wheel escapement mounted on the backplate with beat adjustment on the crutch, stamped: "Japy Frers. 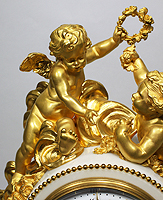 & Cie. Exposition 1855 - Grande Med D' Honneur". 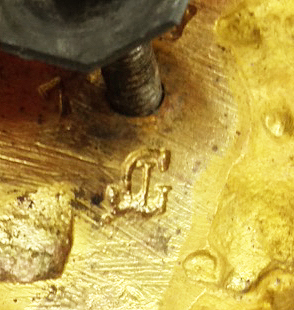 The ormolu stamped "JG". 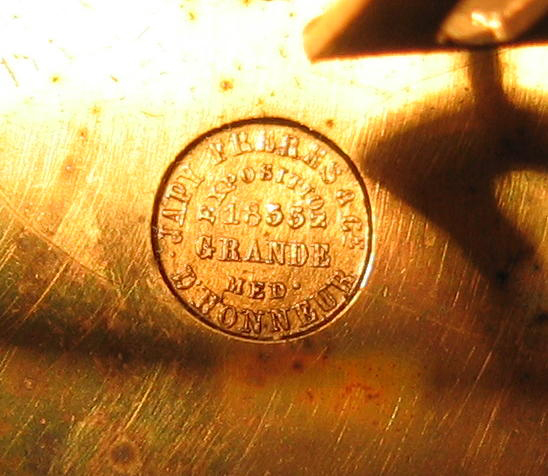 Circa: Paris, 1860's. 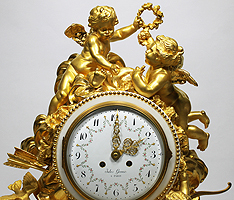 Japy Freres & Cie. was founded by Frederic Japy of Beaucount, born in 1749, and first made movements for the clock industry at his factory in 1777, becoming the largest and most commercially important clock making concern in France. 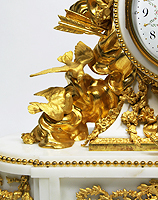 Japy Freres & Cie. supplied movements for some of France's greatest sculptures like Léon Messagé, Alfred-Emmanuel-Louis Beurdeley, Joseph-Emmanuel Zwiener and François Linke.